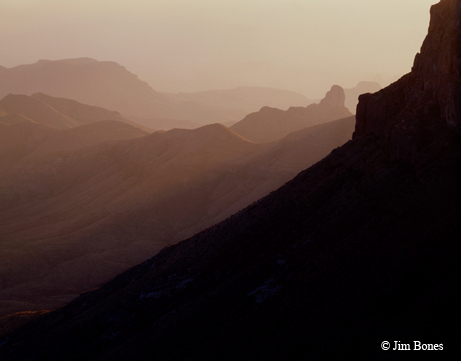 Loss of sight caused photographer Jim Bones to see Big Bend in a different light. 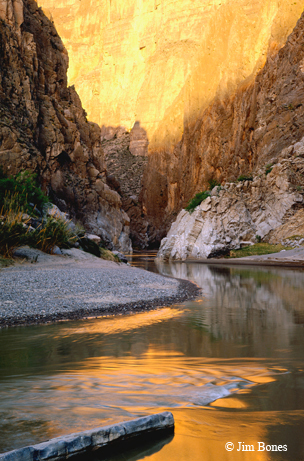 On a boulder-strewn hillside high above the winding Rio Grande, noted landscape photographer Jim Bones peers through his camera viewfinder and sees the massive geological forces that created the face of the Big Bend region of Texas. 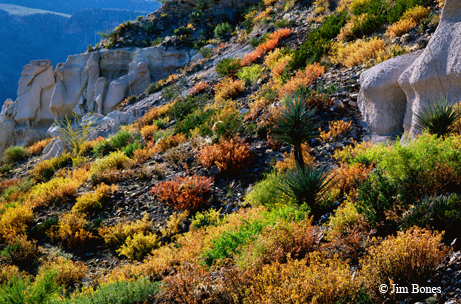 Mountains, canyons, rivers and desert intersect in a land where a calm inland ocean once covered all. That ancient ocean bed was thrust upward by violent upheavals, its layers broken, faulted and folded like paper. 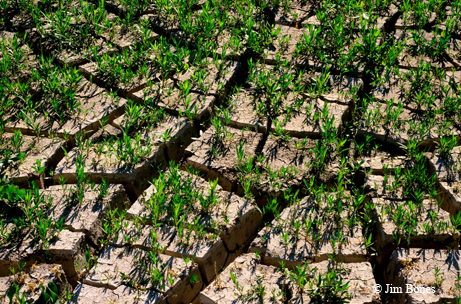 It appears to be a desolate and silent world, but it’s much more than that — it’s also a place of lush grasses, dainty wildflowers and teeming wildlife. For Bones, a stark and visual paradox emerges when the desert’s harsh and unforgiving nature is contrasted against a temporal and fragile ecosystem. A passion for this paradox drives Bones to create his images, not so much as a photographer, but as a visual evangelist with a mission to help others understand, enjoy and become stewards of this world. Raised as the son of an Air Force officer at Vandenberg air base in California during the Cold War, Bones was immersed in an environment of science and technology and was on the path to become an aerospace engineer until he had a life-changing moment one bright California day as he watched sea lions on the beach near Vandenberg. While pursuing his studies at the University of Texas, Bones took a geology class from William Muehlberger, whose charismatic teaching methods inspired him to look at the world in a more personal way. “He made me want to communicate my love of the earth in a way that was not so scientific,” says Bones, who found that geology was the perfect way to combine his love for technology with the natural world. 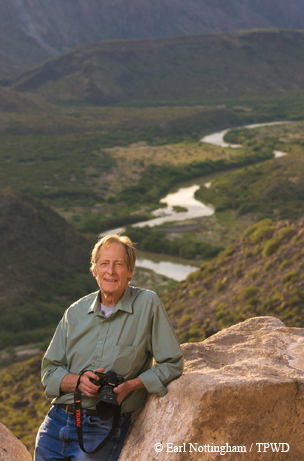 He gained access to a photographic darkroom in the science department and was soon shooting and processing his own black-and-white images from frequent geological study trips to Big Bend, photos he subsequently entered into the university’s exhibits. It was during one of these exhibits that his work caught the eye of photo instructor Russell Lee, the renowned Farm Security Administration photographer who had documented the plights of families during the Great Depression and Dust Bowl. Discovering Porter’s delicate color images of grand landscapes and close-ups proved to be a seminal moment for Bones, who had been working until then just in black and white. 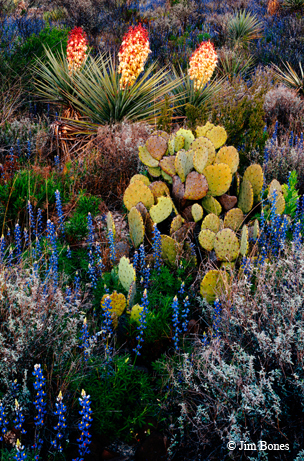 Upon graduation in 1972, he became the first photographer to receive the Dobie Paisano Fellowship Award. After Paisano, with an eye for photography and a knack for technology, Bones seized an opportunity to work for Eliot Porter as his darkroom technician, making Porter’s color prints using the dye-transfer method of printing, a time-intensive process that renders gorgeous photographs of archival quality. In fact, while many photographic films and prints have faded over the years, most dye-transfer images still retain their original beauty. 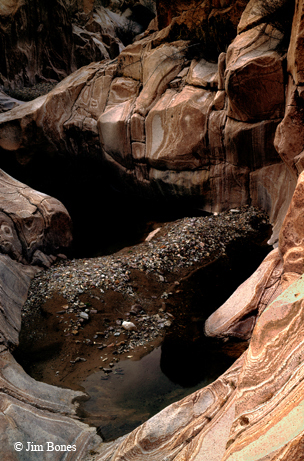 After venturing out on his own across the American Southwest and Big Bend, Bones combined his dye-transfer skills with the tack-sharp images from his 4x5 view camera, creating his own visual style and showing that, under its harsh veneer, the desert is beautiful and worthy of experiencing. 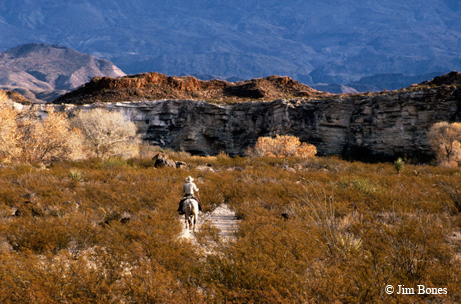 Like the twisting course and unpredictable currents of the Rio Grande, Bones found that life can also be unpredictable. On an October morning in 2001, a photographer’s worst nightmare came true. Bones describes the resulting struggle over the next few years, with bad vision and mounting medical bills, as a form of post-traumatic stress disorder. Hope arrived with the advent of digital photography. Bones was able to digitally scan his transparencies and work with the images on a computer, which, combined with a digital printer, became his new darkroom. A new digital camera replaced the venerable old 4x5 and medium-format cameras. After a long and winding journey, the Rio Grande comes to an end and is transformed into a new life as part of the Gulf of Mexico. Jim Bones’ journey has allowed him to be transformed and see photography — and life — as a new and brilliant palette. "The world I see now is not the sharp-edged world of the 4x5 camera," Bones says. "It is an impressionistic world, and I can understand how Matisse, Renoir and the other painters late in life started doing those large, fuzzy things of color as opposed to precise detail. As artists, we are only temporary vessels that inherit something, create something and then pass it along. It's still a beautiful world to see - so beautiful - and I'm happy to share it."